Yes, I am quoting a ridiculous chant straight from Sister Act II. 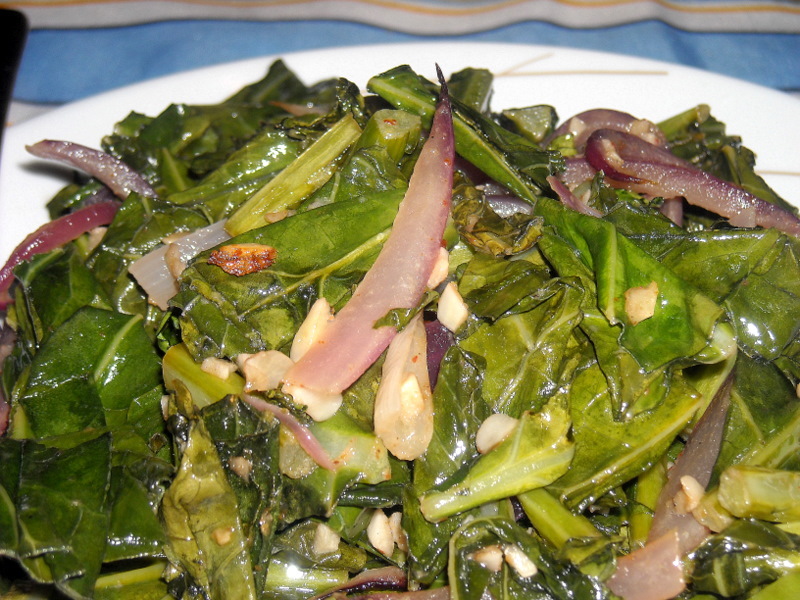 And yes, I am posting a recipe for collard greens. Before you say “disgusting!” to the screen and exit out of this window, let me say something unbelievable–they’re good! This is quite an achievement, admitting they’re yummy, as I’m not from the South. But my newest article for Patch had forced me to turn the cabbage-relative into something edible. And I did it! Such a feat! 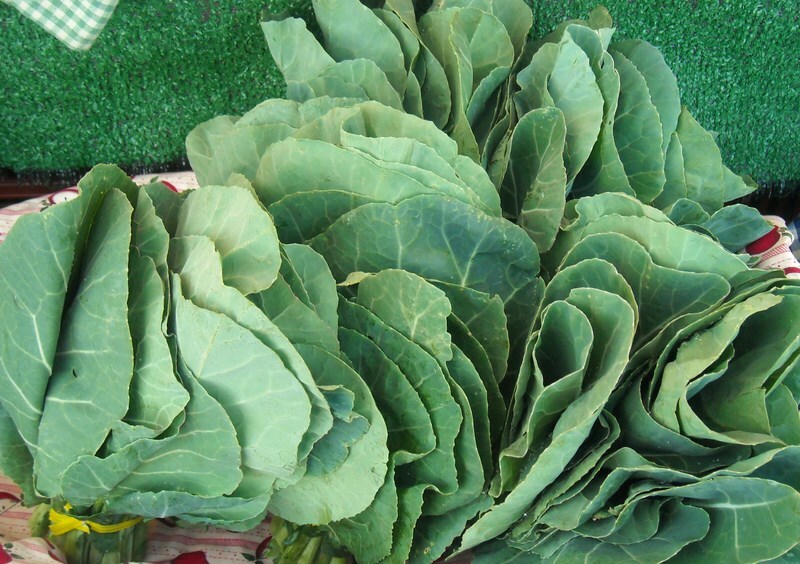 Collard greens are very healthy for you (lots o’ fiber and vitamin C, and very low cal! Some also claim it contains anti-cancer properties, but I’m no doctor so I’ll let you all believe what you will) and are a nice, filling side dish to any main course–chicken, fish, beef. I’ve never cooked collard greens in my life, but I do know that they’re usually served wilted and cooked with some kind of fat (usually bacon or ham hock fat–remember, they’re a Southern thing). I wanted to keep things light, so I used a mustard vinaigrette from Cooking Light and paired it with red onion and garlic. 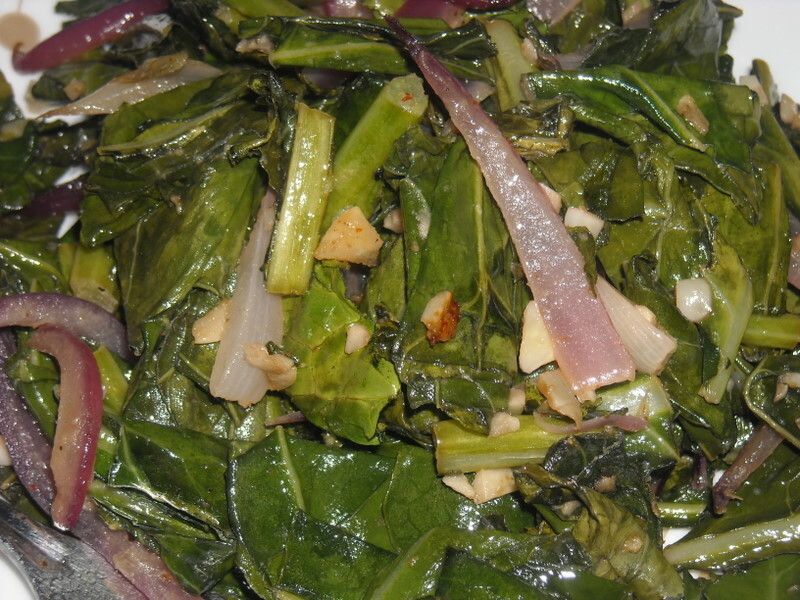 I sauteed those collard greens until they were soft and wilted (took much, much, longer than spinach, to my foolish surprise). The result? Tender, savory greens that I would most definitely make again–but not with cold beans. Throw in the chopped collard greens and toss to evenly coat. Salt and pepper at this time if you’d like. 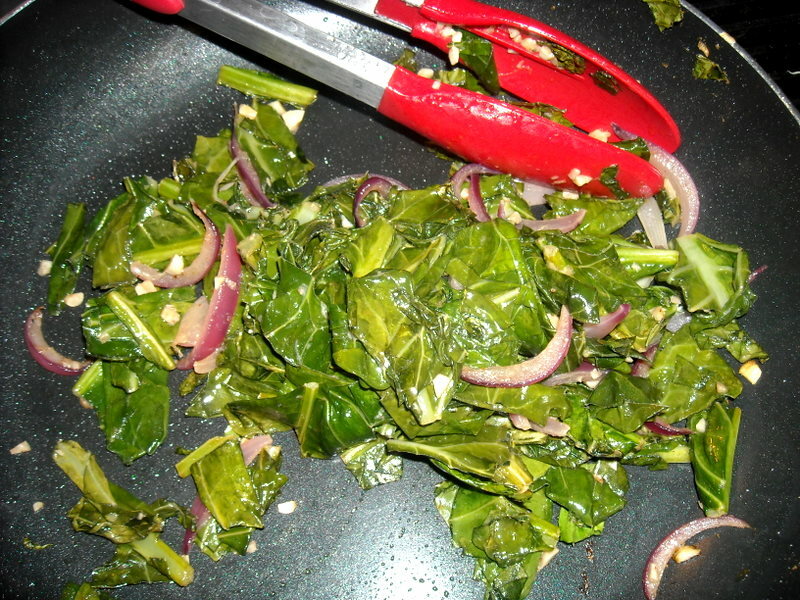 Sprinkle some Cayenne pepper over the entire pan of greens–use about 1/8 tsp. to start. Add more if you like things spicy. Cook for about 10 minutes, or until completely soft and wilted. You don’t want a crunch–you want the texture of wilted spinach. If the leaves start to get crispy and fry, turn the heat to low and let it do its thang. Serve with your choice of protein–tofu, white-fleshed fish, chicken, steak. Cook up diced turkey bacon, remove from pan, and cook the greens in the leftover fat with a little bit of olive oil, if needed. Sprinkle the cooked bacon on top of the finished collard greens.